In the foothills of the mighty Nepalese Himalaya the Kathmandu valley sprawls across 230 square miles and is the most densely populated part of Nepal with a population of 2.5 million and three of the largest cities. 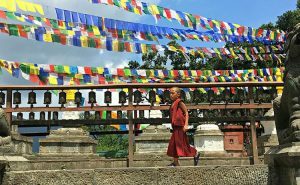 The contrast to travellers arriving wearily from the mountains is huge but the change of pace is worth it as the 7 UNESCO sites of Kathmandu Valley are a cultural feast for the mind, soul and senses, a real joy to explore. The seven UNESCO sites should be top of your list of things to do in Kathmandu and they can be found in the capital city of Kathmandu, neighbouring Bhaktapur and Patan (Lalitpur) and a small village nearby. These groups of buildings and individual monuments are a fascinating illustration of how Buddhism and Hinduism have developed and intertwined over thousands of years. Nepal is a multi-ethnic country which has seen the two main religions prosper together and this largely peaceful co-existence is what makes the country so special. Many of the buildings in Nepal were severely damaged by the devastating earthquake of 2015. As you explore you will see the repairs and renovations continuing. The Nepalese rely heavily on tourism and, unless you are in Nepal for the mountains, it is these stunning buildings which bring tourists to Kathmandu. A large reduction in the number of tourists after the earthquake has made a huge difference to the economy and fixing the precious UNESCO sites is a part of the re-birth of a struggling city. Swayambunath sits atop a green hill high above Kathmandu and is one of the most well-loved temples in the area. Catch a mini-bus or a taxi from the city centre and, depending on traffic, it takes 30 minutes to get to. It was our first stop on a mountain biking tour of Kathmandu and it was a difficult moment for my legs as I got off the bike and had to climb the 365 steep stone steps that lead up to the temple. The temple itself is a fantastic mix of Buddhist and Hindu imagery with a huge white, shining Stupa as the centrepiece. The dome is topped with a golden spire and the painted eyes of a quizzical Buddha. Many come just to see the monkeys. They are everywhere! At your feet, on top of temple roofs, dangling above doorways and they aren’t all that cute if you get too close so beware! We saw a local lady terrorised into giving up her chocolate ice cream by one furry little criminal. Don’t be surprised if you witness a stand-off between monkey gangs, life is brutal for a Swayambhunath monkey. Every morning and evening religious devotees arrive to complete circuits of the stupa spinning the many prayer wheels dotted around the temple as they go. Swayambhunath is used for lots of religious ceremonies, it is a living and breathing part of the religious lives of the people of Kathmandu. The views of the city are breath-taking. There’s an area of the temple which is full of souvenir stalls, at the edge of here there’s a wall over which you can see the whole of Kathmandu laid out like a colourful sari. At sunset and sunrise the views would be incredible. 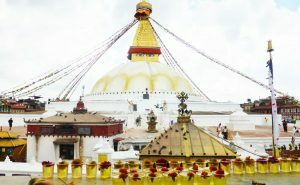 Boudhanath Stupa is the biggest stupa in the whole of Nepal and is most holy Tibetan Buddhist temple not in Tibet itself. Tibetan culture in Kathmandu is strong and this stupa is the centre of that belief system and way of life. The Boudhanath stupa is on the outskirts of Kathmandu and can be reached through what looks like a simple alleyway off the main road. As you step out of the gloom into the circular grounds the stupa towers above you, white and gleaming with a golden spire and Buddha’s eyes. Around the rim of the stupa there is an eclectic mix of souvenir shops and wonderfully decorated monasteries. If you’re lucky you will arrive in time to hear prayers, chanting and the brass band which startled the life out of me. Do check which monasteries are open to visitors and respect any rules displayed at the entrance. 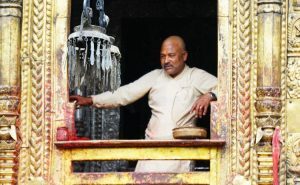 3 km north of Kathmandu in the village of Deopatan lies Pashupaninath a Hindu temple built in the 5th century. 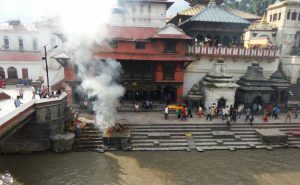 It is dedicated to one of Lord Shiva’s incarnations, Pashupati. It is the largest collections of temples in Nepal and stretches along either side of the Bagmati river. There is a large pagoda temple with a gilded silver roof and only Hindus are allowed inside. We stayed on the opposite side of the river and explored the smaller temples with their many stone representations of shiva lingam (the male phallus). They are also the haunts of ‘holy men’ wearing only a loin-cloths, white chalk paint and daubs of saffron and who want payment for, admittedly very cool, photos. More very cheeky and slightly terrifying monkeys patrol the area. The temple is used as a hospice for elderly Hindus from all over the region who come in the last weeks of their lives. 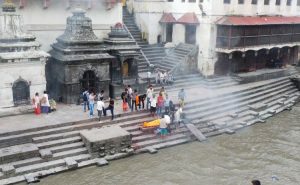 When they die their family gathers on the riverbank next to pyres to watch the burning of their loved ones, body and the ashes being spread into the river below. The Bengati eventually meets the Ganges, the holy river. It’s poignant and sad to watch all this happening in a public place with life going on around and tourists like us casting a curious eye. 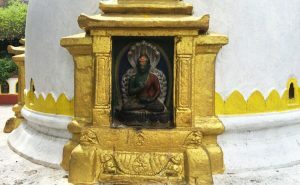 Changu Narayan is the name of a small village and the temple within it. It is the oldest Hindu temple still being used in the Kathmandu Valley and is dedicated to Vishnu, the preserver and protector. The peace to be found here, away from the cities, is lovely and being this far off the tourist path will make you feel like an adventurer! I discovered on a trek in the hills around Kathmandu. The main pagoda is guarded by carvings of mythic and real creatures and the roof is gloriously decorated with depictions of deities. 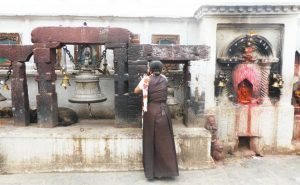 Changu Narayan is the smallest of the UNESCO sites of the Kathmandu Valley and is a real gem housing several small temples and statues depicting Hindu iconography. The locals still create the fabulous stone and wood carvings that their ancestors have done for centuries and the ladies of the village chat in the street as they collect water for their washing. The atmosphere here, just as in the rest of Nepal, is easy-going, friendly and welcoming. The Durbar Square of Kathmandu. Kathmandu’s Durbar Square is in the old town and is the heart of the city. The awe-inspiring array of traditional buildings are where kings had their coronation ceremonies and from where they ruled. The architecture is stunning despite the damage done in the recent earthquake. The intricate and meaningful designs make it feel like you are reading a book not just looking at a building. Most of the square was built in the 17th and 18th centuries though some of the original buildings are much, much older and have many stories to tell. The whole area was made a UNESCO World Heritage Site in 1979 but actually consists of three separate squares including Basantapur and Hanuman Doka, the palace building itself. Make sure you leave lots of time to take everything in, you’ll probably find yourself frequently lost in thought, staring at an unusual image carved into the wall of an ancient temple. 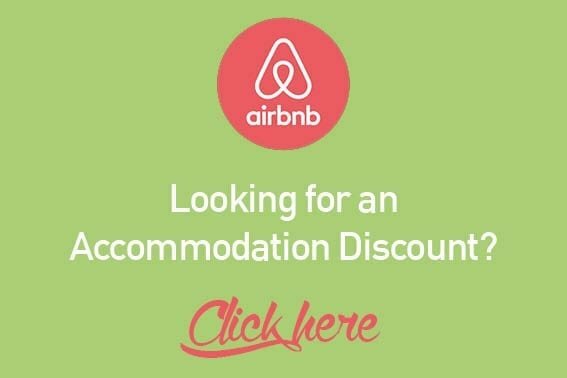 Bhaktapur is 13km away from Kathmandu. The Durbar Square here is similar to the one in Kathmandu in that it is really a district of smaller connecting squares all full of beautiful buildings, temples and palaces. The smaller city that surrounds the square makes for a much more chilled out and relaxing visit. The buildings seem to be much more well preserved, possibly because of the purposeful lack of traffic nearby, and renovations were in place even before the earthquake wreaked its havoc. Patan or Lalitpur is the oldest of the three cities in the Kathmandu Valley if not the whole of the Buddhist world. The Durbar Square is rich with Hindu temples, Buddhist monuments and all are gorgeously and intricately decorated. The Patan museum here is well worth a visit as it contains lots of objects that help tell the story of the buildings you are exploring. The courtyards, called Chowks, interconnect and around every corner there is something else to make your jaw drop. The Golden Temple, built in the 12th century, glistens when the sunshine hits it right and is amazing to look at.